Die Shop Equipment – Cutawl Saws – AmeriKen Online! 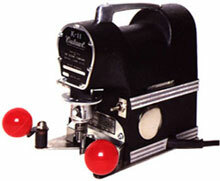 Cutawl saws are high-speed, portable, precision saws specially designed for making rotary and flat dies. They cut hard maple or birch dieboard quickly and easily, unlike commercially available sabre-type saws which burn out quickly. Straight lines, curves, or intricate patterns are simple to cut with free-floating 360 degree swivel head. The curved base plate for making rotary dies is high quality, one-piece cast aluminum. The flat base plate is made of stainless steel. Both the flat and rotary models will accomodate blades to cut 2, 3, or 4 point kerf and have standard 115V, 50-60 Hz motors. Optional equipment includes a 230V, 50-60 Hz motor, a radio frequency interference suppresser, and a safety gauge (required in Canada). Cutawl parts and sawblades are also available.